Home » Musings » Christmas Card Carol 2018: Will You Come to the Manger? Before internet shopping was a thing, getting Christmas presents shipped before Thanksgiving was definitely one of my goals. A rarely-achieved goal, but still… (In the US, our Thanksgiving holiday is the 4th Thursday in November. This coming Thursday in fact. 🙂 ) Now that Amazon Prime does most of my shipping for me, I can usually check that box.. The somewhat-more-difficult-and-even-more-rarely-achieved goal of getting my Christmas Card Carol done before Thanksgiving remains, however, and Amazon Prime helps not at all. But… ***drum roll*** … this year I did it. For a change. Virtual back-pats welcome. This year’s carol is called “Will You Come to the Manger?” It’s set for solo voice, and for duet. This version is performed by Jacosa and Tupua Ainu’u, two lovely friends who left the islands of Hawai’i a couple years back to settle in Atlanta–about as far across country as you can go. Jacosa and Tupua are now bringing the spirit of Aloha and a taste of Polynesian culture to friends in Georgia through their company, “Cousin T Entertainment,” and to the rest of us through their YouTube channel. The accompaniments are identical in both versions. It’s available in three keys, and you are, of course, welcome to transpose it into any other key you need. In other news, I finally conquered the frustration of formatting and got the “My Heart Sings” elementary piano book done. (More back pats are in order here. Many more.) 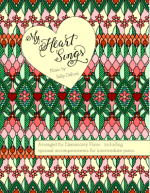 It contains all the songs from the “My Heart Sings” album, simplified for elementary piano with optional intermediate accompaniments. The scores are all here on site for free–just check the individual song pages. If you want the bound book, it’s available here. Thanks again for another lovely song. We were introduced to your music in our ward choir singing “I Have Not Seen, Yet I Believe” then at Christmas “My All is Thine.” Listening to those songs brings back fond memories of that ward and friends. Sally: I just want to say that your arrangement of “O, Holy Night” is the best arrangement I’ve ever used, and I’ve been in church/choral music for a very long time. God has blessed you with so many gifts-including a generous heart to share your music with us. Thank you and happy Thanksgiving! You never cease to amaze with your prose, poetry, rhyme, and music. SO much talent you have and a beautiful spirit of sharing your talent. Many pats on your back you deserve. Ah! A virtual back-pat! Just what I needed! 😉 Thank you so much! Love your music, you have such an inspired gift that blesses so many. Thank you so much for sharing your music with all of us. Very touching composition. Love it! Thank you for sharing it with us, church musicians. May God continue to bless you for what you do. Very touching. Love it. Thank you so much. May God bless you. And *you* couldn’t be nicer! Thank you! So beautiful! I love your compositions and our choir loves to sing them. Thank uou for inspiring us in singing your heartfelt emotions.